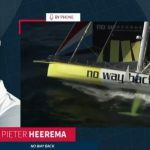 Pieter Heerema is a skilled sailor currently taking part in the Vendee Globe, the world’s hardest race around the globe. It is a single-handed non-stop sailing race which lasts about 10 to 12 weeks. Pieter had an unexpected severe problem with his auto pilot in the middle of the southern Indian ocean, 4500 kilometers away from the next harbor. The autopilot keeps the boat on track. Obviously, the autopilot is a very important piece because the skippers have to go to sleep during 10 weeks alone on a boat. These are true words spoken by a man whose life depends on software. In my opinion this can be applied not just to companies writing software for boat electronics. Here’s the original video. The interview starts at about 3:55.